A new city sign created by Maynard Smith has been installed south of Burlingame. BURLINGAME—A new two-year electrical power supply contract with Westar Energy, Inc., was approved by the Burlingame City Council on Sep. 19. The contract, which will become effective Jan. 1, 2012, will enable Burlingame to continue purchasing a block of power capacity. When the city’s load demand exceeds block capacity, additional power would be provided through the city’s generation capacity, supplemented as needed through allocation of hydroelectric power produced by the Southwestern Power Administration and the Western Area Power Administration. 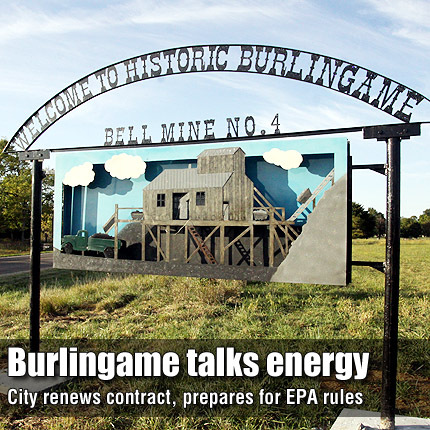 The contract calls for Burlingame to pay three charges, plus applicable taxes, to Westar for each billing period. A demand charge will be billed at $9.58 per kilowatt-month for Burlingame to receive 1,600 Kilowatts per hour (kWh) block capacity. An energy charge will be billed for the cost of Westar to produce the block of capacity from its generating sources. A variable operation and maintenance (VOM) charge will be billed at $2.28 per Megawatt (MW) of power received by Burlingame. Currently, Burlingame is billed a demand charge of $9.82 for 1,700 kWh and VOM charge of $2.18 MW. BURLINGAME—The Burlingame City Council conducted a special meeting Sept. 23 to discuss and approve documents related to securing funds to improve the city’s electrical plant and power distribution system. The meeting included representatives Christie Czarnek and Joseph McMurtry from Morrow Engineering, Inc., Donna Crawford from Government Assistance Services (GAS), Greg Wright from Energy Management Group (EMG) and CPA Stephen Connelly. The meeting outlined project work to adapt the city’s diesel generators to conform to the Reciprocating Internal Combustion Engine (RICE) rule, enacted by the EPA in 2010 and scheduled to begin enforcement in 2013. To conform to the new standard, each of the city’s four diesel engines would be modified with installation of a catalytic converter. The project also includes an upgrade to the transformer on the Westar transmission lines, the city’s primary power source. Morrow Engineering estimated the project would cost $971,000. A Community Development Block Grant (CDBG) could provide $400,000. The remainder, approximately $571,000, would be funded by issuance and sale of Electrical Utility System Revenue Bonds.